Game description: Sora, Donald and Goofy travel down a long road that meanders through endless fields, and come to a crossroads. As Sora stands in the crossroads, he gazes up at the night sky and thinks of his lost friends. Just then, a mysterious man approaches from down one of the branching paths. "Ahead lies something you need," he says, "but to claim it, you must lose something dear." The man vanishes before a single path, leading to a castle that eerily resembles a girl's drawing... In the coming journey, what will Sora and his companions gain, and what will they lose? In addition to Sora, players can control Riku in this adventure that bridges the gap between Kingdom Hearts and Kingdom Hearts II A full 3D remake of the original GBA release, Kingdom Hearts Re:Chain of Memories offers a refreshing rendition of the hit title for the PlayStation 2 system. The talented voice cast from the North American releases of Kingdom Hearts and Kingdom Hearts II, including David Gallagher and Haley Joel Osment, return to breathe new life into the beloved characters. The mini-game catalog has been completely renewed, now with four brand new experiences accompanying the main adventure. USA v02.20(10/02/2006) Very rare to happen any little insignificcant shadow bug, for this turn on alpha hack in GSdx and play on perfection. It's possible appear some glitches in some cinematics in hardware mode, this not affect the game experience, in software mode it's fine. This is a remake of the Game Boy Advance version, titled Kingdom Hearts Chain of Memories. 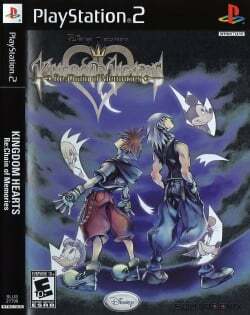 When it was remade for PlayStation 2 the name was changed to Kingdom Hearts Re:Chain of Memories. Description: Shadows are Lines or unrealistic. Workaround: Go to Config > Video (GS) > Plugin Settings, turn on "Enable HW Hacks", go to Configure Hacks and enable the "Alpha" hack. Description: When loading new areas sometimes you see a Sora's ragdoll hovering in blackness for a split second. Workaround: There is no known solution. Workaround: This has been fixed in recent PCSX2 v1.5.0 git builds. For older versions, temporarily switch to Software mode with the F9 key, or go to Config > Emulation Settings > Game Fixes tab, turn on "Enable manual game fixes" and enable the "Switch to GSdx software rendering when an FMV plays" fix. This page was last edited on 16 April 2019, at 08:30.